It’s interesting that Disney would remake one of its most divisive films with Tim Burton at the helm. While the origins of the lovable flying elephant have sparked many a debate over its racial and class overtones, Burton’s ‘Dumbo’ soars down a darker flight path. The original story penned by Helen Aberson and Harold Pearl is sanitised by screenwriter Ehren Kruger, largely staying true to the basics, with omissions of the more controversial narratives, including the racial allegory of the black crows that Dumbo encounters during a boozy afternoon. In fact, Burton’s ‘Dumbo’ entirely does away with the trio of birds, including pack leader Jim Crow, which many have disputed was a direct exemplification of the American Jim Crow laws that enforced racial segregation at the time. The 1941 animation went on to win an Oscar for Best Score but it didn’t gain brownie points for political correctness. The children’s movie narrated the tale of a circus elephant, often ridiculed for his big ears and called dumb, thus earning him the nickname Dumbo. During a routine circus act, Dumbo is bullied by members of the crowd, resulting in his mother, Mrs Jumbo, retaliating aggressively. Soon enough, baby Dumbo is cruelly separated from his mother who is later locked up. To revisit a tale that almost glorified animal cruelty is a very fine line to tread, and while Burton attempts to redeem Dumbo’s dark past, the penance churns up mixed feelings. Dumbo 2.0 sets a similar premise to the original, with a few liberties that work in fits and bursts but are largely weighed down by a convoluted narrative. Burton’s version takes us to year 1919 at the end of the First World War, making his ‘Dumbo’ an origin story of sorts and perhaps going ways in dismissing its darker predecessor. Here Dumbo’s bestie, Timothy Q Mouse, is replaced by humans in the form of the Farrier children, Milly (Nico Parker) and her brother Joe (Finley Hobbins). The family, headed by war hero Holt Farrier (Colin Farrell), are troupe members in Max Medici’s (Danny DeVito) travelling circus. The orphaned kids, who have lost their mother to influenza and are largely dismissed by their father, find a sweet sort of comfort in a young Dumbo whose mother has been shipped away following a freak incident that results in the death of a troupe member. There are some genuine heartfelt moments here that hark back to Burton of old from ‘Edward Scissorhands’ (1990) with a naive and uncertain Dumbo trying to fit in a world that calls him a freak on account of his oversized ears. The scene where the children discover Dumbo can actually fly is pure Burton gold that, unfortunately, is too fleeting to hold on to as the second and third act rolls around. 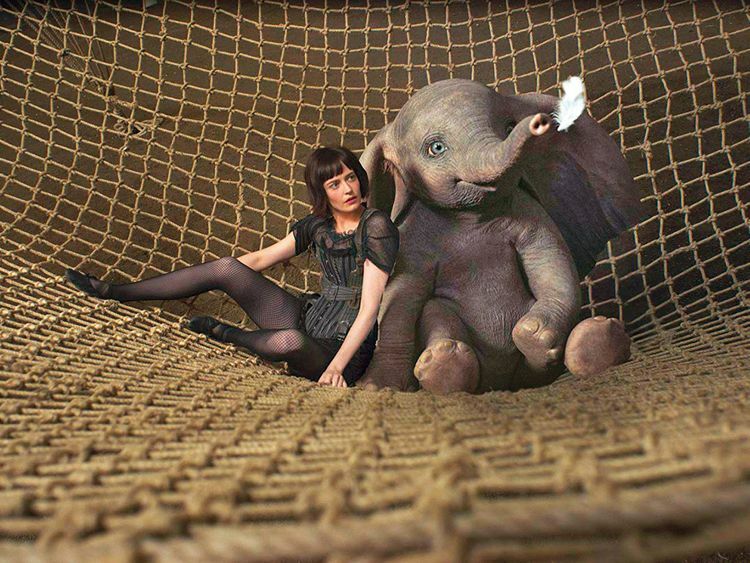 As Dumbo takes flight, so does news of this miraculous feat, drawing in a slimy investor VA Vandevere (a brilliant Michael Keaton) and his flying acrobat, Colette Marchant (Eva Green). With the narrative now moving to a Coney Island-esque Dreamland, the rest of the movie unravels with predictable ennui that steers ‘Dumbo’ towards a bumpy landing. We would be lying if we said there aren’t moments where Burton’s spark of brilliance shines through. A scene where Dumbo sees pink elephants, a euphemism for a drunken hallucination, is very tastefully reimagined by Burton. For those who’ve seen the 1941 classic would recall that it was in fact a drunken afternoon that saw the animated Dumbo hallucinate the pink elephants and it was what propelled him to fly. Here, Burton keeps the retelling child friendly, and in fact, drops in a scene where DeVito’s Max pointedly mentions that bubbles have no place near a baby elephants. Touche Disney. In terms of acting, DeVito does what he usually does as the ringleader of the travelling band of merry men and women, while Farrell sleepwalks through most of the film. Green is the perhaps the film’s saving grace, looking like a million bucks with her sassy style. Ultimately, though, it is ‘Dumbo’s’ very premise that many could find distressing. In a world where we are constantly speaking up against cruelty to animals, circus acts exploiting furry creatures is frankly, disgraceful. The film’s very vocal volte face in act three appears too convenient. Agreed, the Medici Circus avoids the use of the more ferocious kind of four-legged creatures, but its very existence in the film’s narrative highlights the perilous nature of a far more dangerous animal — the human. Perhaps this has been Burton’s message all along and only we failed to realise it up until now. Maybe what we need in the world today is a little bit of humanity to soar as high as Dumbo’s flight. ‘Dumbo’ is out on March 25 in the UAE.